Yep, that’s right – Rockets! Probably one of the most obscure mini-trends, but one that’s developed a fair number of examples. 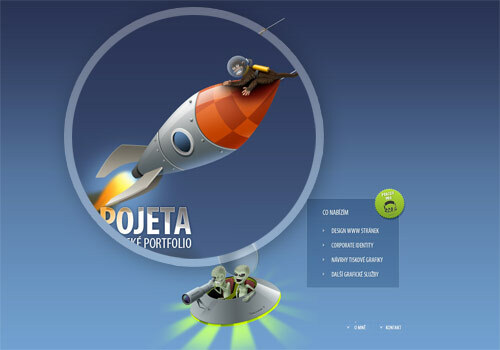 Rockets and spaceships are appearing in a range of website designs and layouts. Let’s take a look at some examples of websites using rockets and spaceships effectively. We’ve also included some resources where you can find free rocket/spaceship graphics of your own. You will find some cool icons and vector illustrations at the bottom of this article. This website belongs to a web designer from Toronto and it is a nice example of how to integrate spaceships into the image of your site. It has a retro/vintage paper texture as the background and an overall sepia-toned color palette. Turbomilk creates icons, characters and many different illustrations for apps and deals with companies all over the globe. They also offer web design services and their portfolio can be visible on their site. Their website design is full of cartoonish illustrations, which give it a fun and childish (but in a good way!) vibe. With the help of easyrocketstudio.com you can create your own e-sports portal. They have a fun, space-inspired website design. The website starts with a loading animation of an alien UFO abducting a cow. How fun and unusual is that?! They also use rockets and spaceships in a really unique way – to define their service modules/packages. Makedo.net’s aim is making WordPress more accessible. Their website design displays beautifully on any screen size. They combine high-quality illustrations with cartoon characters on their background. This makes their site unique and easy to remember. The color palette is carefully chosen, and the green, light and dark blue shades blend perfectly together. It also makes use of white space in a very smart way, make sure you check out the site! Rawkes is a web design studio that explores different digital activities like games, programming and so much more. Check out their space-themed design! The use of spaceships and rockets is more subtle in this design. You will see the space reference in the slider, and also in the footer. 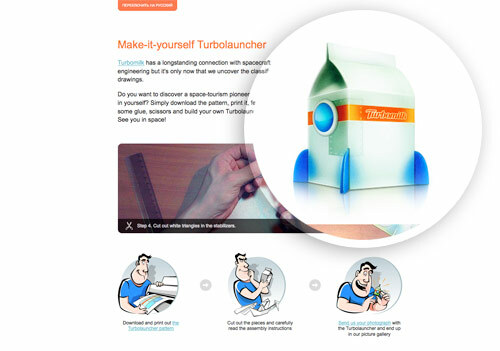 This interactive website lets you print a spaceship model and then teaches you how to build your own Turbolauncher. How cool is that?! Do to the nature of this business, they used lots of rocket/spaceship illustration in their design. Other than that, the layout is quite simple and clean. This website is a way to document space-based observations and discoveries through the Hubble Space Telescope. Of course, the Hubble website must be space-themed! In this case, no vector illustrations were used, but instead, the focus is on super high-quality images taken by the Hubble telescope. Spaceship Collaborative is a team of people committed to creating innovative projects for communities. Both their website and logo are space/rocket-themed. The website’s background is colored in a deep, dark blue shade, to resemble the space atmosphere. This website is really helpful when you’re in need of creative ideas for you and your business. They have some fun, space/alien-themed vector illustrations but also, as you scroll down, you will find other unusual drawings worth checking out, even though they are not space-themed. Websitelaunchpad is a company focused on SEO, SEM services. Their website is designed to catch the visitors’ attention and make them wonder about the vastness of space. Their logo is also spaceship-themed and matches the whole branding perfectly. It has a simple layout with a basic, grid gallery to showcase their projects. There’s a bunch of cool rocket and spaceship graphics available for free on the web. If you want to follow the rockets and spaceships web design trend but don’t know where to start, here’s a roundup of various stock images, icons, and general graphics with spaceships and rockets. Be sure to check out the premium stock websites for plenty more resources and also read each freebie’s license individually, before using. Here are some wonderful icons of man’s journey to the Moon. Feel free to download them and use in your space-themed design projects. Looking for a rocket illustration to use in your designs? Here is a free stock photo you can download. It has a simple, flat design, with a gray outline, like in a hand-drawn illustration. This is a fun, cartoonish, space rocket illustration given for free on a stock photo website. Its the same as the above example, just on a different background and in a different angle. This is a simple rocket illustration that comes as a free stock photo you can download. It’s red and has some subtle 3D gradients and shadows. This retro rocket design comes as a free PSD you can download and customize with just a few clicks. It’s perfect for retro/vintage website designs, due to the color choice. Liked your post very much. Above all websites’ design is mind blowing & very attractive. I am also going to launch one website but now I recommend one of the above website. Very Informative Post About Rockets. I like it. I really like the “old school” rocket look that has come back in style. The rockets remind me of something you might find on a ’60s board game box or toy packaging. Very cool! unique designs. thanks for having this. it gives me idea of what to do. Hi, nice collection, I´m working in a rocket illustration, and this is very helpful. Chris. Wow, what a unique idea. I love it. Thanks Chris for mentioning us! Here at Turbomilk we like to be in the trend. Hope next trend will be strange vegetables. New project is being launched soon. Stay tuned. Hey Chris, thanks for including my website (Rawkes) on the list. You may be interested in another rocket type logo I made for a recent project of mine: British Space Organisation. We love the rockets. http://www.zoom7.com Have a huge collection of vintage and repro in our lobby. Good to others share the love.. Very nice collection of rockets! This is such an interesting website.I really loved the pictures.The rocket pictures are attractive.It is a nice website to browse through. Nice collection of websites there Chris! The rockets seem to fit in with the whole retro trend that seems to be doing the rounds. Space and rockets is a great theme. It seems to be used a lot in website designs. I have often noticed a lot of starry night backgrounds. They are overdone, but they do always look great so it makes sense. Amazing! I really loved the milk carton ones! The sites look fun! Great roundup, Chris! Feel free to use if anyone wants. I’m surprised that no one has mentioned that it’s also the 40th anniversary of the Apollo mission to the moon. Maybe all that buzz about space travel has helped encourage this trend. If you want to know more about web designing, there are lots of online tips and guide for you to learn. Also, if you are lacking of tools and software, you can immediately download it online. These tips would really help you understand a lot of things about web designing and development. Spaceship! Yes. I wanna have one, a real one. A nice dream and a ….. Why it can’t be a trend? Wonderful thinking. seems like a pretty crazy trend… but now I know! Thanks for the feature of Frenzy Labs! 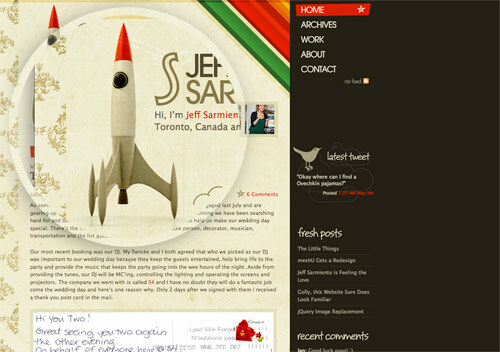 My blog has rockets and spaceships too! Nice. I like the overly simple one best (last on the list). I’m a fan of abstractions :) I remember seeing a lot of rockets outside of the web recently, like on shirts and stuff. So many rockets! I love the paperlauncher milk carton one, nice stuff! Here’s another one: http://www.pojeta.cz/ (scroll to the top). Brilliant, added it to the list! Love this article. It’s amazing how trends like this go under the radar for a while then explode. We’ll probably see a lot more of these popping up over the next year. Great write up as always Chris. Nice roundup Chris! I really like rocket/spaceships (who doesn’t? ), and I see them too often popping up more and more on the web. Really like the “fat-rocket” from RK Launcher. Also, nice article by “zooming in” the rockets! Keep up the great work :)! It’s amazing how you don’t even notice small things like that, and then they become a trend! I wonder what else is out there?